Goodreads says, "With her knack for being in trouble's way, Sookie witnesses the firebombing of Merlotte's, the bar where she works. Since Sam Merlotte is now known to be two-natured, suspicion falls immediately on the anti-shifters in the area. Sookie suspects otherwise, but her attention is divided when she realizes that her lover Eric Northman and his "child" Pam are plotting to kill the vampire who is now their master. Gradually, Sookie is drawn into the plot-which is much more complicated than she knows." The story opens up with Sookie present for a firebombing at Merlotte's and most assume it's because Sam "came out" as being two natured. However, Sookie thinks otherwise; after all, she knows she has many enemies. There's also major drama surrounding Eric and Pam regarding the vampire who is their "master." They are plotting to kill him, which is a huge undertaking and of course, Sookie ends up getting involved. Dead Reckoning by Charlaine Harris is another fun addition to the Sookie Stackhouse series. I will admit that I was hesitant to read Dead Reckoning at first, because Dead in the Family wasn't as good as I hoped. It was too morose and moody; however, Dead Reckoning definitely isn't as dark. Yes, it lacked some of Harris' usual sparkle; however, she captured some of it back that I felt has been missing in the last few books of the series. True, it is not as exciting as it was towards the beginning, but I think that is expected when it's the ELEVENTH book in a series. With that said, I enjoyed Dead Reckoning a bit more than Dead in the Family. Who doesn't love Sookie? She is one of my favorite heroines. I am always laughing at the crazy situations she gets herself into. She's spunky, brave, and down right fun. I liked that readers learned more about her family and her past in this novel, especially regarding her fairy bloodline. The other characters were, as usual, extremely entertaining. Eric Northman (my favorite!) was preoccupied with Pam and some vampire drama in this book, so he wasn't around romantic-wise as much, but when he was there, he definitely stole the show. I wish Harris included Jason more as he is only briefly mentioned from time to time. Fans of the Sookie Stackhouse series will have a lot of fun visiting Sookie's crazy world for awhile. This series, for me, is truly mind-candy. 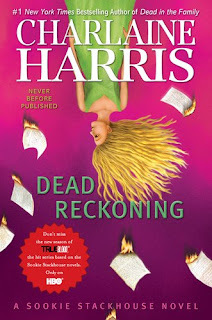 Without a doubt, I will definitely be picking up the next book in the series, which comes out next May, because Harris left us questioning a few things at the end of Dead Reckoning. One thing is for sure, nothing starts off a fun summer like Sookie! I read enjoyed Dead in the Family, but Dead Reckoning was a little flat for me. You're right, it didn't have it's usual sparkle that is found in the other books. I think this book was basically setting us up for the ending, since there are only two books left. I am still looking forward to the next one! I'm reading this one right now. I have about 100 pages to go. So far, I'm not enjoying it as much as you but hopefully it will get better. I'm starting to get a little frustrated with the series - I hope she doesn't drag it on past the couple of books left in her contract! I still enjoy reading them, but I think its all starting to wear a little thin for me. Still, I agree - this one was a lot more enjoyable than Death in the Family!